I hemmed and hawed, super intimidated to actually put my feet down in a studio where I assumed most of the other students had established practices that would leave me struggling to catch up. It was only after Sonia brought her illustrious teacher and owner of Luna Yoga, Jennifer Maagendans, to my home that I decided to just let go of my fears and see what lay in wait for me at the studio in Old Montreal. The rest, as they say, is history. From my first class, I felt I was home. The energy that spills out of the studio itself is indescribable. In equal measures peaceful and stimulating, I found a missing part of myself within the security of those four walls. I spent the next few months attending classes and deepening my practice while developing a real, true friendship with Jenn, and then with her partner Jason Kent. Sonia had told me that Jason was a tough sell, hard to get to know, but I knew I was on the right track when his response to my calling him Debbie Downer at our first meeting was met with a reluctant grin (accompanied by Jenn’s sheer delight in Jason being addressed as such by a stranger :)). Little did I know that the events that brought me to Luna would serve as the foundation for the next chapter of my life, in which I would completely leave my then-career behind with no clue as to what I would do job-wise. Events unfolded that saw Jenn ask me if I would be interested in co-managing her studio, saw Jenn challenge me to follow my heart and pursue careers in the domains that nurtured my soul, and saw Jenn take time out of our workdays to train me one-on-one to complement the Ashtanga training I was doing in 2009. Jenn became the person who, with little pomp or grandeur, illuminated the path ahead of me and simply helped me re-shift my gaze so I could see it as a viable possibility, one that has since brought me to a place where I continually, and on a daily basis, am reminded of the blessings that being true to one’s Self bestows. Jenn challenged me in those training sessions to teach her as a group class, as an individual private class, and as a private group class, but her teachings didn’t end there: she led by example, in every single thing she did and said. She continues to do so, demonstrating how by combining passion, a strong work ethic, and proper attention paid to that which comes naturally can propel one further along one’s dharmic path. She constantly challenges me to be a better version of myself, even when she’s completely oblivious to it. So what has Jenn been to me? An opener of doors, a pillar of support, the remover of darkness, and the swelling of laughter that buoys my own giggles past the point of control. She believed in me when I didn’t believe in myself, and she continues to be my guru, my mentor, my example, confidante, and friend. And Jason? Without Jason, I’m not sure Luna would even have gotten off the ground. Jason was a huge support for Jenn when she was first considering opening a studio, and has been ever since. If Jenn has become my soul-sister, then Jason is my soul-brother. A fellow Libran, Jason reflects back to me my own habits and tendencies, and he has grown from Jenn’s partner into a true friend, someone who has helped me, often without even being aware of it, when I most needed it. His heights of sarcasm and jest are matched in kind by the depths of his kindness and sensitivity. Jenn and Jason are the real deal. They have built up the studio over the last fourteen years with the sheer force of their collective will and focus, creating a home for the teachers they have welcomed into their fold, as well as a space for me to bring my business knowledge into their creation, and then topping it all off with the two most beautiful little boys to add to their brood of yogic misfits. On July 13, our community will celebrate Luna Yoga’s 14th anniversary. The studio they originally started with limited funds and maximal dreams 14 years ago has grown into a force to be reckoned with, with its own sold-out Teacher Training Program, as well as classes and workshops that reflect the diversity of the students who call Luna Yoga home, all the while maintaining its grassroots feel and sense of real, true community. Luna has students who have been around since before the studio opened its doors. This is more than a testament to the studio’s location or teachings: it’s a testament to Jenn and Jason. If you’ve got a glass handy, raise it to these two, whose drive and ability to weather the toughest of storms has kept Luna’s doors open for well over a decade. If you don’t have a glass, then close your eyes for a moment, and silently send them a kind thought. They continue to show how doing something for others always brings you to where you need to be, and they do so with respect, intelligence, and grace. Happy anniversary to you both, J & J, and to the entire Luna family, past, present and future! Well said Bram!! Before meditating I often give thanks to Jenn and Jason, and people like them, who open businesses and open their hearts… and make such a wonderful difference to my life. Luna Yoga is a gem! 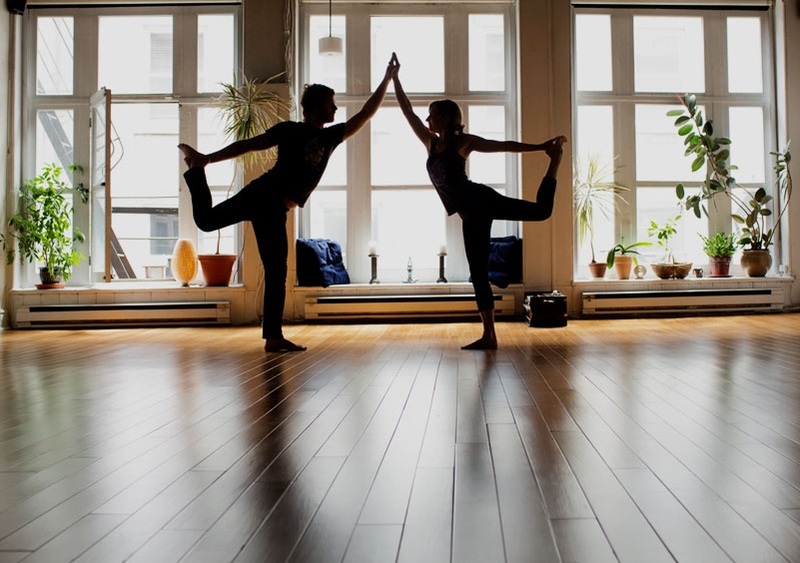 A yoga studio like no other in Montreal! Congrats to all of you!